Sure this is a little work, but perfect for an inexpensive impressive dinner party. This Italian Stuffed Meatloaf is not only impressive but quite a show stopper on a plate! The stuffing is superb, amazing gourmet style meatloaf that will wow your family and friends. It's easy to make and so impressive. The eggs are in the center when you cut it along with ingredients such as spinach or escarole. Many of the time strips of pancetta are layed over the top for extra flavor or bacon. When we wanted something extra special to serve guests this would be on the table. Most of the time it would be served around a holiday as a treat. It's easy to make on any week night and perfect comfort food on a chilly night. 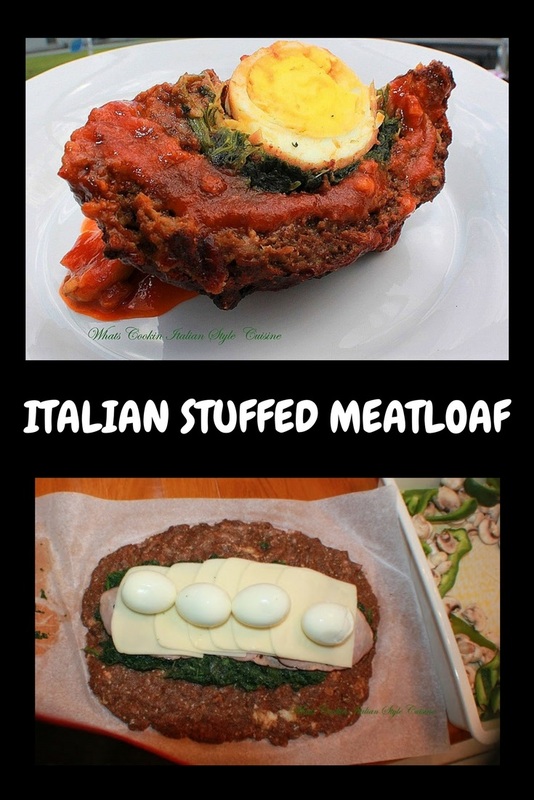 If you are looking for an original Italian style meatloaf try this recipe. Or these fun meatloaf cupcakes. My step by step photos will help you see how easy this is to put together. You really won't need anything more to serve except maybe some potatoes you love. I tried to photograph every step to help you visualize how easy this is to make. It can look intimidating but I promise you it will be over the top gourmet but easy to make! This is a filling meal, all in one pan and really flavorful. It sure beats the regular ordinary meatloaf for a change of pace. I love the spinach sauteed in olive oil and garlic first. It really kicks up the flavors. Are You An Egg Fan? This recipe can be changed if you're not an egg fan or have allergies. Stuffing can be anything you like with the greens, even mashed garlic potatoes! You can change it up with whatever you like around it, peppers, mushrooms are our favorite, maybe your family likes baby onions. Try adding potatoes around the meat and bake them if you love potatoes. After slicing the meatloaf and seeing the pretty filling, it looks wonderful on a bed of rice or even a pretty lettuce leaf. You can really wow your family and friends with presentation. I know that this looks a little more complicated than most meals. Not so. It's very simple to make. After the meat is mixed the actual stuffed for this Italian Stuffed Meatloaf is already the main part. You can stuff it with anything you prefer. This meatloaf is the way mom made it growing up. Boiled eggs were used in many stuffings for us. If you aren't a fan of eggs, use another vegetable or all spinach. As long as the meat is seasoned first anything can go inside. My kids are big big fans of cheese. Sometimes that's all I add to the middle. I like to use cheeses that easily melt. I usually do use a blend of mozzarella, swiss and cheddar. I am sure you will get creative and come up with some great ideas for baking this great Italian Stuffed Meatloaf, but it's great as it's written! In my family we will forever love Italian Food. This Italian Meatloaf is sure to please everyone you meet! Mix the ground beef, eggs, squeezed bread, 2 eggs, bread crumbs, 1/2 cup grated cheese, salt, pepper to taste, garlic and parsley in a large mixing bowl. Spread this out into 2 inch thick square or circle onto wax paper or plastic wrap. First spread the sauteed spinach or escarole in the center middle end to end. Then the ham of choice, cheese, eggs on top. I sprinkle it all with grated cheese, parsley and granulated garlic for more flavor. Using the wax paper roll sealing sides and having seam down until you cover all open spots. Carefully put into a prepared baking dish seam side down. If using vegetables place around the meat. Pour sauce on top around 1/2 cup sprinkle with more grated cheese and fresh parsley or dried. Lay the pancetta over the top. Bake at 350 degree hot oven until browned around 1 hour depending on how thick and big this is. Use more sauce if started to dry out while baking. Great idea with mince met which is something boring but surely not prepared this way. Claudia My mom used to make a similar stuffed meatloaf, less the hot cappi. I'm definitely going to try your recipe! I love meatloaf and your version looks and sounds so delicious! Perfect idea for hosting and for dinner parties! I've never had meatloaf, but my does this sound good. Love your step by step instructions too! This is comfort food at its best! My family would love it. Nicely explained recipe with steps. Very helpful. I just LOVE that surprise in the middle! !